During the first morning, the performers created a series of tableaus documenting various emotions and characters including “Birdcatcher” and “Queen.” As the students formed a pose, Music Director Barbara Lynne Jamison asked each student to come up with a sound that embodied his or her emotional state in that pose. As she walked around the group, students started their sounds when she tapped them on the shoulder. Though the participants had never sung opera before, within minutes, we had our first chorus. Makara plays Tamino while the chorus of spirits looks on. As the week progressed, Kelly began to stage larger chunks of the now-completed script. 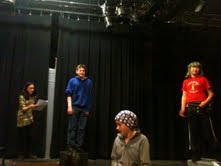 For the aria “Dies Bildnis,” the students formed a human picture frame around Pamina (played by Linda, age 10). For Papageno’s aria "Der Vogelfänger bin ich ja," Sequin (age 12) lead the performers in darting around the stage and sweeping birds into a net. Kelly and Barbara also focused on making the music a character in itself. To that end, the students listened to the march of the priests and helped imagine the choreography in response to the melody and mood of the piece. Linda, Adrian, Melvina, and Sequin strike a pose. The final performance on Friday afternoon was fantastic. The joy the participants felt at succeeding in a genre they had never tried before was palpable. From start to finish, the camp transformed students who were shy about singing and acting into talented performers who were able to seamlessly blend a variety of skills. Congratulations to everyone who participated! If you missed this camp, check out this recent blog post for information about Seattle Opera’s Pirates of Penzance Camp at the Seattle Public Theater this summer and about Song Pirates, Ahoy!, a pirate-themed 826 Seattle workshop in July. 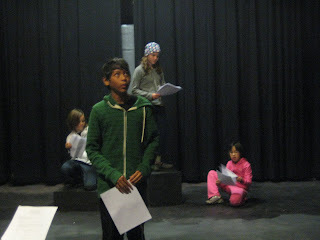 This is a GREAT way to introduce opera to young people -- getting them involved DOING opera!!!! When I was in junior & senior high some friends and I acted roles in ocomplete operas to the "tune" of the operas on the old shellac 78 r.p.m. records; this meant a "music director" (rotated) was assigned the "role" of changing the records. What became of my then-colleagues I do not know, as I went off to the Mid-West to college and lost touch with them. Wait a moment; I DO know what happened to one of these colleagues, John Browning, who went off to Julliard and became a very competent concert pianist, but if he retained a love of opera, I don't know. This helped ME move further long as an opera fan, and thus I know the value of such an activity as you are offering young people!!! Right on!!!! Spring is just around the corner and after that bend, summer in the horizon. I am excited for the new season of performing arts. I have trips lined up to Seattle and Boston for the performance arts.